A 7-Step Community Engagement Model You Can Apply to Your Green Cleaning Program Today! In a new series of blogs, we’re highlighting inspiring stories about the ways that schools and universities across the country are using engagement to strengthen their green cleaning and environmental initiatives. We are thrilled to share the story of one school district in Illinois who was able to engage its students and parents in a campaign to stop cars from idling at pickup using positive reinforcement, education and a hit video on social media. This project is not only cleaning up the air and making schools healthier—especially for students with asthma—but it’s also educating students and the community about the important role they play in protecting our environment. Well done, CCSD93! Pay attention to your school’s parking lot around 3 p.m. How many cars are waiting around with their engines running? Now look at the height of all that exhaust. Right around the height of a kindergartener’s airways, right? According to the U.S. EPA, idling vehicles emit air toxins that increase children’s risk of developing asthma and other respiratory problems—and can even cause cancer. It wastes gas and pollutes the environment, too. For one community in Illinois, this was a problem worth taking on. Through a partnership with a local nonprofit, strategic meetings with key stakeholders, and a well-organized online video campaign, this district was able to stop car idling in its tracks. SCARCE (School Community Assistance for Recycling and Composting Education) is an Illinois-based nonprofit that spearheads a number of community programs to promote sustainability. Kay McKeen, SCARCE’s founder and executive director, approached school district CCSD93 in suburban Chicago and a few other nearby districts to encourage them to push for anti-idling in the pickup lines at schools as well. She was instrumental in writing Illinois’ state legislation that requires buses to turn off their engines. While it’s not every day that a school is approached by a local advocate and expert with resources and passion to start a sustainability project, that doesn’t mean your school can’t find its own champion. Look for strategic partners like SCARCE by going outside of your school’s staff and programming. Many communities have nonprofits committed to recycling, composting and air quality who would be happy to engage and advise in a project. Other partners could be local chapters of the Environmental Protection Agency (EPA), churches, parks and recreation departments or city government. Kay began the anti-idling project by meeting with school superintendents and PTAs. She attended board meetings, PTA meetings and also requested individual meetings with superintendents in order to educate these key stakeholders on what idling does to the environment and the health of students. At the same time, she applied for grants from local foundations to get anti-idling signs for each school. At one board meeting, Kay presented her plan and was then approached by a community member who owned a sign company. He was able to provide the district with a steep discount on signage. This shows that attending many meetings with a large representative of community members pays, even if the benefits don’t seem apparent at first. Check out our online toolkit on chronic absenteeism for more information that can help you develop strategic talking points for your stakeholder meetings. Early on, Kay identified a few superintendents in her community who were really engaged and passionate about environmentalism. These superintendents were able to target schools within their districts to begin an anti-idling communications campaign, including CCSD93. The first step was to get the school’s director of community relations involved. Find that person and work with them! 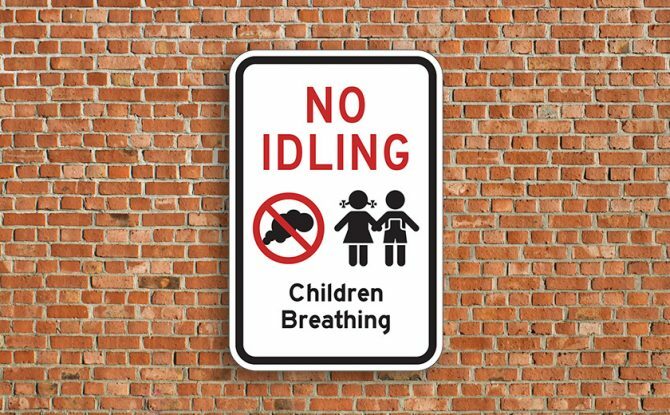 For Ryan McPherrin, CCSD93’s director of community relations, the anti-idling project was the perfect way to promote engagement with students in every facet of their education. Many schools may not have someone in this exact position, but there is surely someone in a school whose responsibilities include communicating programs and events with the parent and student communities. That’s a key stakeholder who will not only offer fresh insight into the right way to deliver messaging, but will bring innovative PR ideas to the table. McPherrin was tasked with spreading the message among his community of students and parents. McPherrin and other members of the school team, including school environmental groups, would speak with parents at pickup about the project. A key component of this push was reinforcing positive behavior (those whose cars were turned off) with tokens of appreciation and gratitude. It was a great opportunity to talk to those who hadn’t turned off their cars about the project and its environmental and health benefits. McPherrin always planned to use students in a video campaign that would promote the anti-idling project online. So he asked school principals to identify students within each school that had participated in environmental groups or helped with recycling and composting projects. In other words, these students had a vested interest in the anti-idling project and that helped to not only create a strong video with a clear message, but those students were then able to pass the message around to their peers and parents. Principals, teachers, advisors on student government and environmental groups are all important stakeholders who can help you identify the right students to engage in your own sustainability projects. 7. Go viral and track it! Analytics are built into most social media channels and can be very effective tools in measuring the success of online engagement efforts like this one. The person who manages your school’s social media accounts will be familiar with these tools. Make sure to ask them to track all likes and shares for any communications you put out, and tweak your messaging to increase engagement. These seven steps helped CCSD93 make a huge environmental impact by stopping car idling while educating students, parents and school communities about environmentalism. The engagement factor here provides momentum for new projects, too. It’s a simple equation that any school can start today. We want to hear your engagement stories! If you have experienced an engagement win in your green cleaning program, email Nicole Bowman or share your story with us on social media with the hashtag #greencleanstories.